Setting out to bag the lonely peak of Gulvain there was no risk of overestimating my own abilities but I had lost all sense of distance. Striding out along the track beside the Fionn Lighe, the heat of the early morning sun already rising, I knew that it was a long walk in before we would start climbing. Pausing briefly as we crossed the river I gazed in to temptingly cool, inky black pools as the water lazily slid underneath the bridge. Yet still there was no sign of my goal. I quickened my pace beside the forestry plantation desperate to get to higher ground. There I knew I would be out of reach of the slashing, slicing razor-sharp teeth of the clegs that hovered around me, ready to silently ambush any exposed piece of skin. They had plenty to aim for as I had foolishly opted to wear walking shorts for this outing, providing a Heathrow-sized space for these airborne insect terrorists to hijack my blood. A decision that I came to regret the next day as my legs turned to itchy islands of blotchy, red inflammation and swelling. The welcome first glimpse of the twin-peaked Gulvain, the footpath leaving a clear stony scar on its lower slopes, encouraged me onwards. Yet no matter how many steps I took forward the mountain never seemed to get any closer. Push forward one hundred metres. Stop. Look upwards. The mountain seemed further away than ever. Focus on the summit whilst walking. Surely, then it will gradually seem closer. Another kilometre effortlessly glides by and the grassy slopes obstinately stand still. Temporary distance perception disorder had definitely kicked in. Then all of a sudden it disappears as the steep slope towers above you, shutting out any view of the first summit. The path zigzags relentlessly upwards, the clegs left safely behind. Instead I am joined by bumblebees heavily laden with ruby red pollen and jewel-like dragonflies, emerald green, sapphire blue and jet-black darting to and fro. Their target the carpets of wild thyme and lady’s mantle providing a purple and yellow fringe to the path. These natural delights divert me from the climb and soon I am leaning against the trig point of the minor top. Glancing at the Munro beyond, I wondered if my brain is playing distance tricks again. The summit looks suspiciously close and the drop before any re-ascent only minimal. Not wanting to risk a step too far I check the map. It’s only six hundred metres with a drop of fifty. No delusional distances. On fine summer days you linger at the top desperately wanting to make up for all those days where, blasted by wind and rain you barely pause at a summit. I did just that on Gulvain carefully crossing off the other mountains I could identify, noting the enticing ones not yet climbed. I wanted to remain high for as long as possible as I retraced my steps along the ridge. Even more so, when confronted with a squadron of flying insects primed for their next kamikaze mission towards human skin. 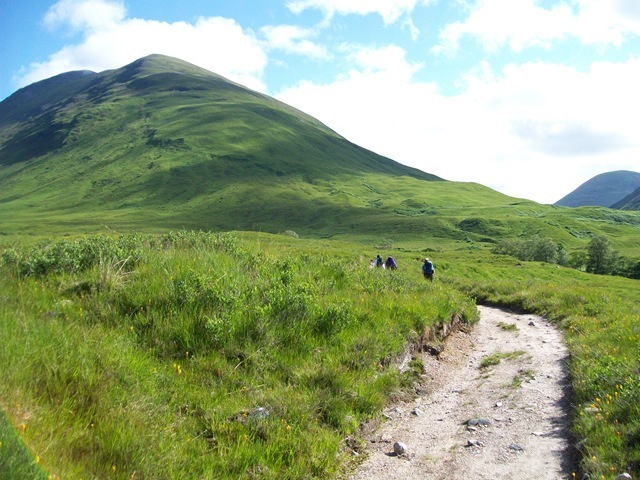 There’s a baker’s dozen of great walks still on offer in the summer programme of the Nevis Hillwalkers. This is my local hillwalking club and although I am unable to go out with them every weekend, whenever I am free I try and spend a day on the hills with them . 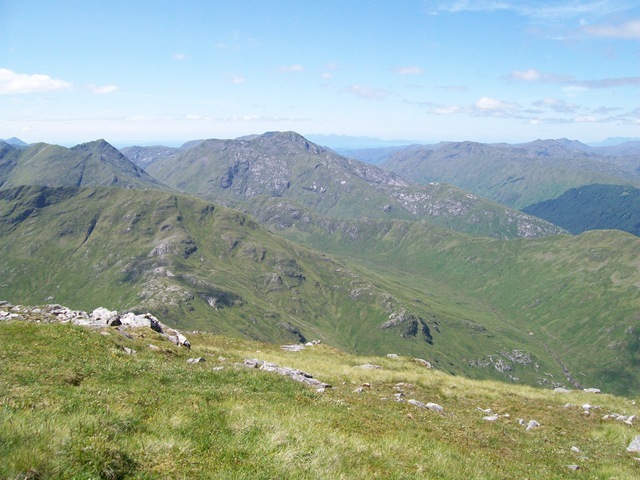 The Five Sisters of Kintail – one of the classic ridge walks in Scotland. Ben Nevis – no tourist track for us, up the Ledge route and descend via the CMD arete. A full traverse of Buachaille Etive Beag from Glen Etive through to Glencoe. Sgurr nan Gillean, Skye – let’s hope the great weather we are having now stretches all the way through to September. I know that walking with a group of people is not to everyone’s taste but this club is a bit different. Even when there is a largish group (say 12) of us out on the hills, you can still get a feeling of solitude. If you want to walk slowly or fast you can do, no one is going to make you walk with the herd. Collectively we will all keep an eye out for each other but we all take individual responsibility. This last weekend whilst out on Gulvain I opted out of joining the rest of the group for the “interesting” steep descent from the summit in to Gleann Fionnlighe and the cleg and midge delights that would greet them there. Instead, wanting to stay high, I walked back in the sunshine along the main ridge. That’s the ethos of the club, the programme is there as a guide but with enough flexibility for us to try different routes if we chose. 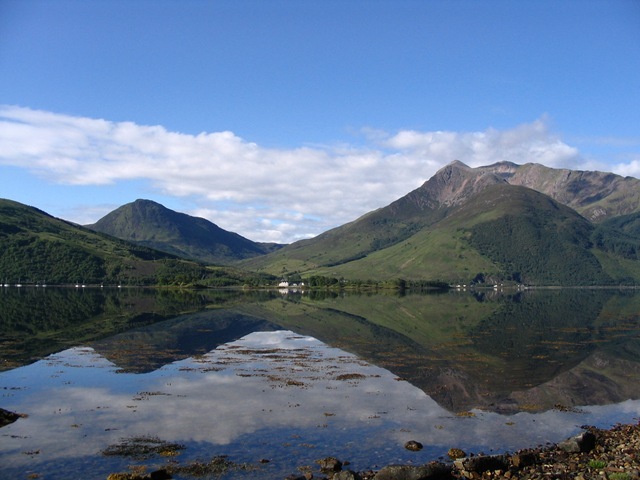 If you are visiting the Lochaber area over the summer and fancy walking with some local people take a look at our programme. Visitors can join us on three club walks a year before having to join. You’ll be assured of a warm welcome. .
You can download our programme here. Or find out more about the club here. If Binnein Beag was a human it would be one of life’s loners. Stuck their in the corner of the playground with its bigger brother Binnein Mor back turned to ignore him, keeping the smaller Beag at arms distance. Why pay any attention to Beag when you can talk excitedly to all your other interesting mates in the Mamores. It’s easy being a mountain when you are the largest in the class. Even the neighbouring bulk of Sgurr Eilde Mor stands to one side a looming, lurking mountain, one you can’t quite trust like the class bully. One moment full of smiles and pats on the back, your best friend and the next a raging temper and pokes in the eyes as you become his sworn enemy, his latest object of spite. Having larked around with the more interesting boys in the Mamore playground I had seen Binnein Beag from a distance but never up close. I was intrigued, I wanted to get closer, wanted to begin to know this shy, retiring mountain, what makes it tick. My task was to go and introduce myself to this elusive mountain and try and start a relationship. Binnein Beag was not going to make this an easy task. I had a long walk into remote country to even catch a glimpse let alone get up close, but the walk along a fine, airy, stalkers path high above the lonely Loch Eilde Mor makes for a quick, unseen approach. Tip-toeing around Coire an Lochain I get my first glimpse of Binnein Beag ahead of me, trying to hide itself behind the broad shoulder of Binnein Beag My pace quickens, eagerly pushing forward to get closer. Who said this encounter was going to be easy? There before me opens the grassy hollow of Allt Coire a’Bhinnein blocking any quick progress towards my target. It is though a deep, fortified moat full of untold horrors has been thrown before me to thwart my onward journey. Not being disheartened I press on, soon descending via zig-zags to the river below, briskly fording it via stepping stones to the path beyond. All the time my goal remains before me. Perhaps, I have been noticed by my lone quarry as it attempts to hide its face with a scarf of wispy cloud, although it is only a momentary mask soon dissipating to reveal the summit again. There’s no hiding from me now, firmly in my sights I stride on to the high bealach separating Beag from Mor, finally ready to introduce myself. Hang on a minute, am I rushing things? No loner will appreciate a hasty, over-confident approach – softly, softly is definitely needed on this occasion. I paused awhile on rocks beside a small lochan, to contemplate, over lunch, the life of a loner. I thought this quiet contemplation would be ruined as I saw a group of fellow walkers paused upon the lower ridge of Binnein Mor, but they were to ascend rather than join me in my quiet space. They obviously recognised that today, like the mountain behind me, I was a loner as well. Close up my quarry doesn’t make it any easier, the shattered slopes of ankle-breaking blocks scattered carelessly in order to catch out the unwary. I am determined though, such defences will only slow but not deter. I make speedy progress nimbly avoiding the loose scree slopes strategically placed to slow and dissuade. The barriers are breached as I reach the small summit plateau and introduce myself to my conquered prey. And now I realise that there are sometimes benefits to being an outsider. Binnein Beag’s solitude gives an opportunity to appreciate things from a distance. Those other mountains that you take for granted up close take on a different persona from this angle. The mighty bulk of Ben Nevis dominates Glen Nevis stretching back along the Grey Corries. Straight ahead, the other Mamores snake off into the distance. Glancing behind, you look straight in to the dark barren depths of Rannoch Moor. At this point, as you stare transfixed into miles of nothingness, you understand that perhaps loneliness is all relative. Whenever I drive home from Fort William my eyes are always drawn beyond the Ballachulish Bridge to the scimitar ridge of Beinn a’Bheitr above. The curving knife-edge neatly framing the forestry plantations as they plunge down in to Glenahulish below. Whatever the season, whatever the weather you always notice something different about these mountains. The setting sun glinting from the wet rocky ridges following a late afternoon shower. The Dragon’s tooth menacingly erupting from the primordial swirling mists carpeting the corrie floor. Sweeping, seemingly virgin, snow fields, as crisp as freshly pressed cotton laid out over the ridge and flowing down into the high corries below. What simple delights the crowds miss as they steam across the bridge eyes firmly fixed on the craggier delights of Glencoe. 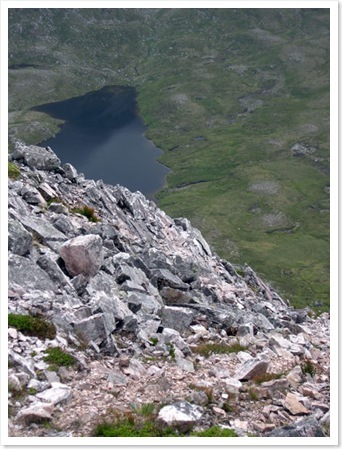 Although I have climbed the two Munros of Sgorr Dearg and Sgorr Dhonuill before, I am not so obsessed with bagging that I would refuse to climb a peak again before completing a round. With limited, low level walking over the winter this was the perfect chance to give some underused muscles a workout. There is no better way to reach the main ridge then climbing from the north-east to the minor top of Sgorr Ban. 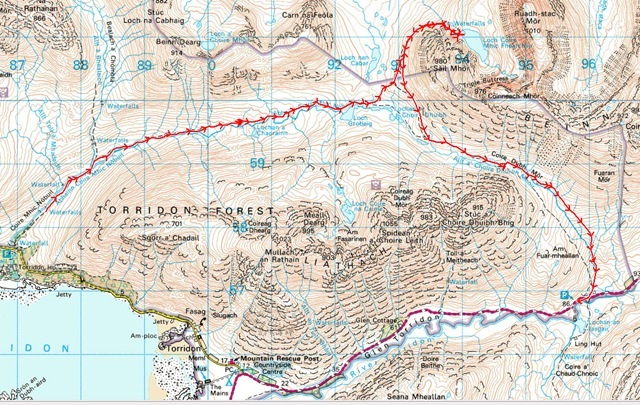 In fact this is the recommended route in “Scrambles of Lochaber”, describing it as a straightforward scramble with beautiful views. Instead, as I tramped up the boggy ground to the start of the scramble I had to content myself with imagining the Glencoe summits without their cloudy shroud. The way up is always clear with a few interesting moves but little exposure, making it perfect for anyone who has never scrambled before. As I was plodding along, my companions ahead merged in to the grey fog, spectres floating in and out of sight. There was a real feeling of solitude as I was enveloped in the murky silence. The fog thickened on the approach to Sgorr Dhearg, the edge of the cornice barely visible and only a hint of the corrie beyond. A quick check of compass and map at the summit gave us our bearings to descend towards the col before the stiff climb up to Sgorr Dhonuill. At the col it seemed that we might have to descend to Glenachulish as the way ahead seemed to be blocked by an extensive snowfield. Both ice-axe and crampons had been consigned to the car boot before setting off, deemed to be unnecessary on such a day. Fortunately, the snow was limited and where it needed crossing it was soft enough to walk through or in unexposed areas presenting no particular danger. Beyond the summit of the second munro we opted for the quicker descent down the “Red Scree Gully” rather than continuing around the ridge. Although steep and unstable in places the gully soon leads to a well engineered path and down into the heart of Forestry Commission land and the tracks leading to the small parking area. A pre-arranged driver to ferry us back to our cars meant we avoided the long trek via St John’s Church to Ballachulish. This was a seemingly innocuous route on the map but was to prove a long and tiring day. 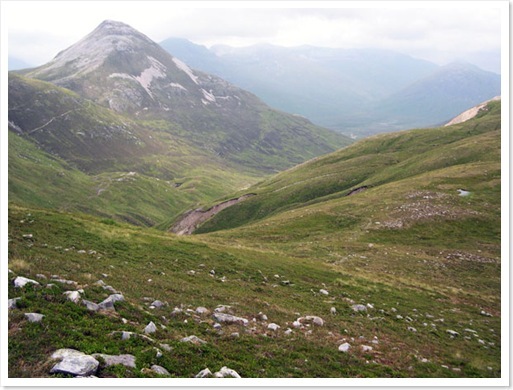 The title should more accurately be, “Round the front of Beinn Alligin and Beinn Dearg before going round the back of Beinn Eighe having followed the full length of Liathach.” Although accurate such a title is unnecessarily cumbersome. I joined the other members of the hillwalking club at Torridon Youth Hostel, where they were based, for the first of their away weekends this year. The mountain forecast included gale force winds and snow blizzards so I opted for the lower level walk rather than attempt the Horns of Alligin with the more overoptimistic members. This may have been a low level walk but it certainly wasn’t a level one. As we headed out on the National Trust path up Coire Mhic Nobuil, I was lulled into a false sense of an easy day ahead. Having crossed the river, the path soon deteriorated to the rough, roller coaster like path that is normally encountered in the Highlands. 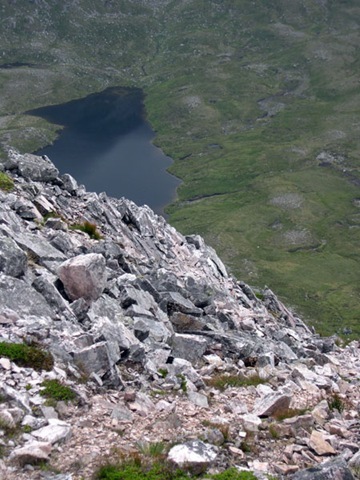 Even so, we still made speedy progress to Loch Grobeig where we departed the path to head across open hillside to the path skirting Beinn Eighe. With the cloud base so low we were unable to enjoy views of the magnificent mountains around us. Tramping through wet, soft snow took us alongside the crashing waterfalls given fresh impetus by the torrent of water falling from the skies, before a sharp rise into the flat-bottomed Coire Mhic Fhearchair. This imposing mountain amphitheatre provided no protection as the wind funnelled driving rain in through its North-West mouth. Somewhere in the cloud the Triple Buttress loomed down upon us, we could only guess at its grandeur but could still feel its rocky menace lurking unseen. By now, with sheets of water draining off the mountainside, we realised that crossing the river on our return would be nearly impossible. Sure enough our way across was blocked by a heaving mass of water ready to knock any foolish walker, trying to ford it, from their feet. At the end of a long day your heart sinks at such an obstacle and the prospect of a long diversion, or even having to retrace your footsteps. Will weary legs carry you further than originally intended? Fortunately by following the east bank of the river, although boggy for much of the way, eventually led tired bodies to a rough path down to the Glen Torridon road and a short walk to our shuttle cars. A long sodden day but one with a great sense of achievement even though no mountain top was conquered. 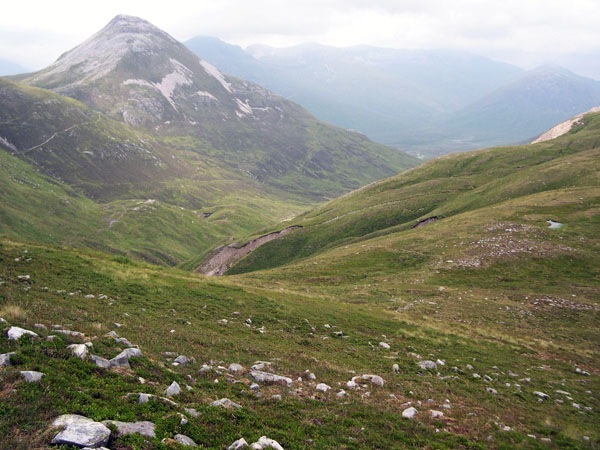 Reports from the hostel told us that the hardy low-level walkers had in fact climbed higher than those that had headed to Beinn Alligin. You would think surrounded by mountains, with some of the best hillwalking in Scotland on my doorstep, that I would frequently puts on my boots and head for the hills. Alas, even with these temptations so close to hand weeks can pass by without stepping forth. Work or other commitments get in the way, the long Bank Holiday weekend coming up when I had planned so much walking, will now see me flying off to Ghana to undertake some consultancy work. The other walk blocker is the weather; I don’t mind walking in the rain but it will often stop me from going out. When walking in a group there is a collective motivation if walking in poor weather. However, if I am out on my own the last thing I want to do is spend hours trudging in a downpour. So, the appalling weather sweeping across the country in recent weeks has curtailed the munro bagging. Tomorrow will see two more added to the list, as I join the walking club to tackle Buachaille Etive Mor. This is one of our members last munros, so I have to make a bit of effort, even if the weather will be far from perfect. I am looking forward to a glass of bubbly at the top. Then I hope to be out again midweek, on my own, to tackle its little brother Buachaille Etive Beag. That is, if the weather doesn’t conspire against me again.